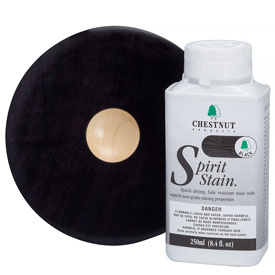 Chestnut Spirit Stains are a high quality, pre-mixed alcohol based stain that offers bright, vibrant colors that last. Made in the UK, Chestnut brand spirit stains can be used straight from the bottle, mixed with other colors or diluted for a delicate wash effect. Seal and finish with a lacquer-based top coat such as spray lacquer. Stunning multi-color effects can be achieved by using a simple layering process as described in Jimmy Clewes Coloring Wood article at the bottom of the page. Comments On Jan 23, 2017:I have made several mason jar lid covers using Chestnut Spirit Stains and the results have been outstanding. The people who have purchased these mason jar lids have been so pleased by the intensity of the color and the beauty of the wood. They would be so surprised to find out that the beautiful wood they love is simply a birch 2 x 4 with spirit stain applied in layers. I have not tried these stains on darker wood yet but the results on any lighter wood is spectacular. Comments On Apr 10, 2015:The two are described the same but perform differently. Where I find the difference is in the final stage. After I color, sandback, and color again I like to MIST the surface with alcohol to further blend things. I find that the ARTISAN dye will bead up and get blotchy very easily. Much like water droplets on a waxed car hood. CHESTNUT dyes react more like motor oil and water. Where the edge, color, and sheen are not very defind. This is a much more desirable look to the eye. Especially at this stage in the process. Comments On Apr 24, 2015:I learned about these from Jimmy Clewes, and these are my Go-To stains. I love the fact they have a shellac already mixed into color, getting uniform color, and transitions are extremely easy! All my customers can't believe the pieces I stain with this are actually wood, the final product is extremely colorful. This is pretty much the only stains I use now, highly recommended.